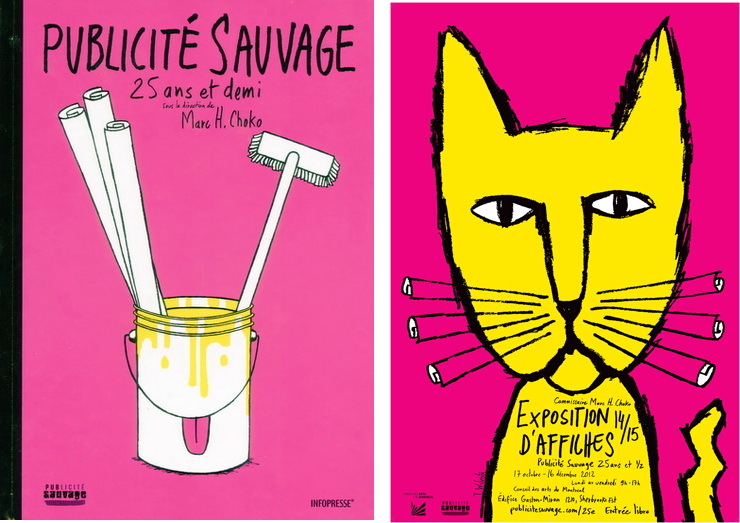 Montreal is fortunate to be in the midst of a poster renaissance. Ad agencies here have realized – much as marketers in Paris in the 1890s did – that posters can reach consumers in a cost-effective, visually impactful way … at a fraction of the cost of television, radio, or even internet-based advertising. One company that recognized this long ago is called Publicité Sauvage, a Montreal-based tour de force in the poster industry. From modest beginnings, Publicité Sauvage has now become so much a force to be reckoned with the some question their stronghold on the industry, but what is uncontested is their single-minded determination to make both posters and Publicité Sauvage known in Montreal and across the country. Last year was the 25th anniversary of the founding of the business, and in celebration of the event, the company enlisted the expertise of Marc Choko (a man we fondly call the Poster King) to create 15 exhibitions of their works in and around the city. We are excited to offer Publicité Sauvage posters here at L’Affichiste and are planning an exhibition of their works in the gallery for Fall 2014. Stay tuned! If you’d like to find out more about the company and their history, and can read in French, you could check here. And if you’d like to buy their book, you can find it here.